BURLINGTON TOWNSHIP, N.J. – When Dawn Ameser decided to move out of her single-family home in Mansfield Township last year, she focused her search for a new home on the new-construction marketplace. She didn’t want to be bothered with the extra work and costs associated with maintaining an older home, and felt there was good value to be found in today’s market. After reading about Lennar’s new River Walk townhome community in Burlington Township, she asked her real estate agent to arrange a tour. In November, Ms. Ameser purchased a Braeburn townhome at River Walk. The Braeburn floor plan is one of four designs the community offers, and features 1,216 square feet of living space with two bedrooms, two full baths, a modern kitchen and a one-car garage. Now that she is settled in, Ms. Ameser is enjoying life at River Walk. She walks along the riverfront every day and likes the community’s new outdoor pool and clubhouse. Because she works long hours, she appreciates that the area is quiet, so she can relax when she does have some free time. No construction takes place on the weekends and neighbors are often out taking walks, sitting on their patios or taking their children to the playground. River Walk’s location near Route 295 is also convenient for Ms. Ameser, because she frequently has to travel around the area for her job in the food service industry. She also likes being near the shops and restaurants of historic downtown Burlington. 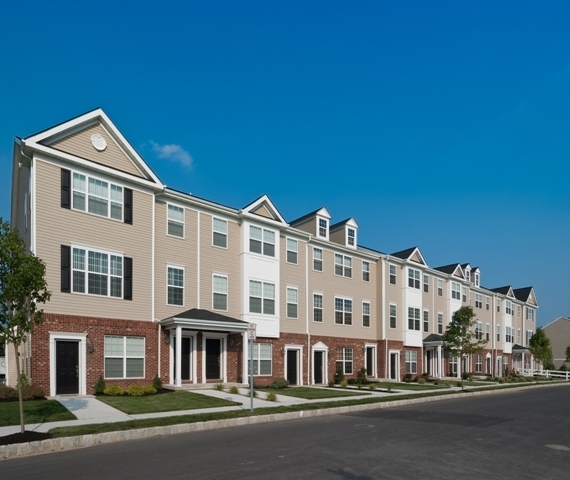 Located on Aqua Lane, near the Delaware River in a pleasant corner of Burlington Township, River Walk is ideally situated near Route 130, Route 295, the New Jersey Turnpike and the New Jersey Turnpike Extension into Pennsylvania. The New Jersey Transit River Line Light Rail system is nearby, offering quick, efficient mass-transportation, with transfers available to Philadelphia. Historic downtown Burlington includes a wide variety of entertainment such as quaint shops, gourmet restaurants and upscale bars and lounges. Two townhome designs and two Carriage Home floor plans are available at River Walk, with more than ten distinctive elevations, creating an attractive streetscape with visually interesting and diverse facades. The townhomes, priced from the low $200,000s, include the Turnbury, which features three bedrooms, two full baths, two half baths, a two-car garage and 1,977 square feet of living space. The Monterey offers three bedrooms, two full baths, two additional half baths and a one-car garage in its 1,729 square-foot design. The Carriage Home designs, priced from the mid-$100,000s include the 1,933 square-foot Princeton model on the upper level and the 1,216 square-foot Braeburn model on the lower level. The Princeton features three bedrooms, two full baths, one half-bath and a one-car garage, while the Braeburn includes two bedrooms, two full baths and a one-car garage. Interested buyers can tour the community’s four furnished model homes which represent all four home designs. All River Walk homeowners enjoy a park-like setting within a row of trees that encircle the property. A multi-acre pocket park in the center of the community provides passive recreation, while a series of winding walking paths and a clubhouse with an exercise room and outdoor pool round out the amenity offering. For more information on River Walk or to schedule a tour, call Internet New Home Consultant Iris Barrios at 609-349-8258. For more information on Lennar’s new communities, visit www.NewFromLennar.com. For more information on Lennar, visit www.Lennar.com.